Here you can find a strain description about Peace Maker (FinestMedicinalSeeds) and also some user-based reviews and infos directly from the SeedFinder (if available). You can also find the offers and auctions here if Peace Maker (FinestMedicinalSeeds) cannabis seeds are on stock at MyCannapot right now. hellmutt Had two seeds both germinated well and easy. She was less than 2 feet tall very bushy and compact she smelled like grapefruit. Lots of frost like trics heavy smell both where grown in a locker. Did not respond well to heavy nutes but once i laid off to 60% of recommended dose they both got fat. They seem to gain lots of weight in the last 2 weeks of flowering. Was harvested in week 10 about 74 days trics where 50/50 amber/cloudy. Yeild was better than average got about 2oz from each plant. Had to let her go a little longer into flowering because she put on a lot of weight in weeks 8-10 in the grouth purt her trics were 90% cloudy 10% amber she stayed that way till week 10 then with in days most of her lower buds turned amber and most of the top buds where clowdy50/50. I could of let her go another week if i wanted to get bigger yeilds but i whent more for my personal taste in high. Dryed for 6 days then jared and cured. Vaped her after the first week of cure but high was weak. Waited till the 3rd week of cure and she was powerful very tryppy high makes u laugh alot. Taste: 7 she really tastes like grapefruit it would be a ten to people that like sour fruity taste. Aroma: 9 she smells like coffe with a hint of garlic very good smell. High 10 its the type of high that just gives u tha giggles with all kinds of happy thoughts racing through your mind. When u think of a memorable strain this is it! Something u wanna keep for special occasions. I give Peace Maker a 10 outta 10. 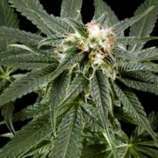 Buy Peace Maker (FinestMedicinalSeeds) now at MyCannapot!